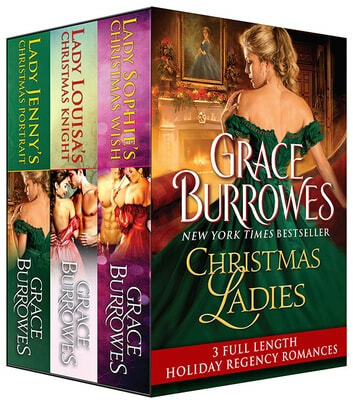 Three luminous holiday tales of romance, passion, and dreams come true, from Grace Burrowes' enormously popular Windham series. Craving a bit of peace and anonymity, Lady Sophie Windham has maneuvered a few days to herself at the ducal mansion in London before she must join her family for Christmas in Kent. Suddenly trapped by a London snowstorm, she finds herself with an abandoned baby and only the assistance of a kind, handsome stranger standing between her and complete disaster. With his estate in ruins, Vim Charpentier sees little to feel festive about this Christmas. His growing attraction for Sophie is the only thing that warms his spirits-but when Sophie's brothers whisk her away, Vim's most painful holiday memories are reawakened. 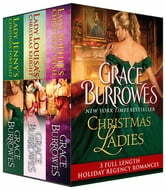 It seems Sophie's been keeping secrets, and now it will take much more than a mistletoe kiss to make her deepest wishes come true. 'Tis the Season for Scandal...Years ago Lady Louisa Windham acted rashly on a dare from her brother, and that indiscretion is about to come to light. She knows her reputation will never survive exposure. Just as she's nearly overwhelmed by her dilemma, Sir Joseph Carrington offers himself to her as a solution. But Sir Joseph has secrets as well, and as he and Louisa become entangled with each other, their deceptions begin to close in on them both. What soft-spoken Lady Jenny Windham wants for Christmas is the freedom to pursue her artistic ambitions, though it will mean scandalizing her ducal parents and abandoning all hope of a family of her own. She confides her plans to successful artist Elijah Harrison, because assisting Elijah will bring Jenny that much closer to her heart's desire-or so she thinks. Elijah finds in his unlikely assistant not only an inspiring muse and unappreciated talent, but also a lovely and passionate woman. If Elijah supports Jenny's career, his own professional interests will suffer, but more significantly, he will lose Jenny forever. Both Jenny and Elijah must choose between true love and a lifelong dream.